It’s not a family trip unless it includes the whole family – that means your pets too! But RV traveling with animals requires proper planning and precaution to make sure they enjoy the time away just as much as you do. Before you hit the road, read our tips on RV travel with pets to make sure your camping trip is fun and worry-free! Not every campground is ideal for pets. When you’re planning, the very first thing you should do is make sure you’ll be heading somewhere that can properly accommodate pets. Most national parks allow pets with certain safety precautions, such as requiring them to always be on a leash. Check park regulations online or call ahead before reserving a spot. Vet Records & Information: Many campgrounds require proof of certain vaccinations, such as rabies. Keep this information handy in case they need to verify the information when you arrive. It’s also a good idea to have copies of their medical history, in case you need to take them to a local vet. Food Stored in Sealed Containers: Packing your pet’s food in a sealed container keeps it fresh and prevents messes. You can divide each container into portions for the day to make it easier too! Remember to pack a little more than you need, just in case your trip takes longer than expected. Identification & Photos: If your furry friend gets loose, you’ll want to have as much help as you can to find them. Make sure their collar includes contact information for you, and bring along recent photos so other campers can keep an eye out for them. Crate/Cage: Some parks require animals to be crated or caged when not being actively watched. Dogs also find comfort in having a personal, safe space, so bringing their crate also helps make the trip more comfortable for them. Toys & Comfort Items: Just like you need to keep your kids entertained on a long road trip, you’ll want to have something fun for your pets to do too! Bringing their favorite toys, or even a blanket that smells like home, can help keep them happy and comfortable during a longer trip. When traveling with pets, you need to take extra precautions to prevent injuries on the road. Even a perfect driver can be cut off or run into hazardous weather, so don’t take any chances. The most important thing to remember is to have the pet in the same vehicle as you. If you’re pulling a trailer, keep them in the car with you and not in the trailer. Not only is it dangerous to leave them unsupervised, your animal will likely suffer extreme stress from being in a moving vehicle by itself. It also creates a situation where you may accidentally leave them behind without realizing it. You should also invest in a proper harness or a carrier that’s designed for vehicle travel. Harnesses or carriers that attach to seatbelts offer the same protection to your animal that they do to you or your children during an accident. It also prevents the animal from moving freely throughout the vehicle, which can be a serious safety hazard. Cats love to explore, and the last place you want them to end up is under the driver’s feet while you’re on the road. 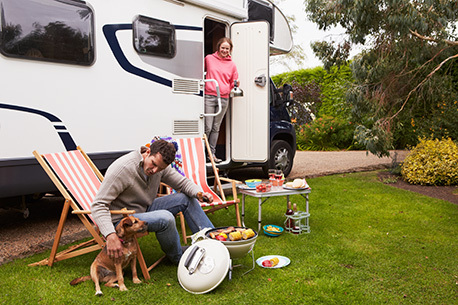 For motorized RVs, use a gate to separate the area between your pet and the door if possible. This will also keep them from interfering with your driving if they get loose. Even if you’re not driving, it helps prevent your pets from bolting out of the door when you open it. A loose animal in a park is a danger to itself, other campers and the wildlife. Any long road trip with pets should be planned around accommodating their needs. If you have a dog, don’t keep them stuck inside all day. Not only will they need to relieve themselves from time to time, it’s better for their physical and mental health to get some fun and exercise outside. A brief stop every 2-4 hours can go a long way to making sure the trip is just as comfortable for them as it is for you! When you finally reach the campgrounds, you and your pets will be looking to relax and enjoy the experience. But make sure to practice proper campground etiquette, for both the safety of your pets and other campers! Keep Your Pet on a Leash: Most parks have rules for this, but even if they don’t, it’s a good idea to keep your pet properly restrained. Even the most well-trained dogs may find something, or someone, irresistible to chase. Never Leave Your Pet Unattended: Just like you wouldn’t leave an animal in a hot or freezing car, leaving your pet in your RV alone can be dangerous. Similarly, even if your pet is tied to the RV or your campsite, never leave them without supervision from you or someone you trust. Always Clean Up After Them: This one goes without saying. Always clean up after your pet – some parks will have specific containers for this, but every park will have some way to clean up waste.